It was good to have F1 back this morning and hopefully a return to more exciting races after last years procession. The changes this year are vast and are acting almost as a reset button on who has the best car. The result of the changes are a set of ugly cars that sound very different to the last few years but have seen a fair amount of change in qualification this morning. Comparing 2013 and 2014 Australian from a team perspective shows just how much change has taken place. Renault in last place shows they are toiling and their struggles in testing have transferred onto Australia. Kimi won for them in Australia last year! Red Bull have actually done better than most expected but the surprise for me was Ferrari – expected a bit more after pre-season testing. 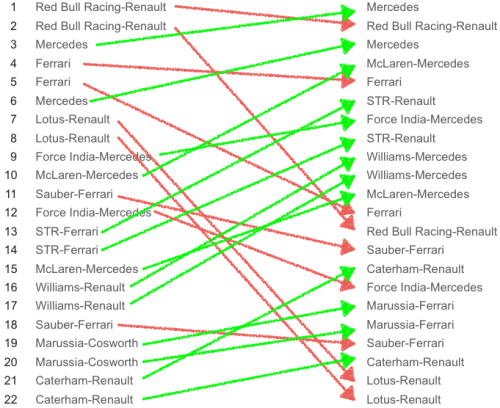 Great to see Williams and McLaren improving after a torrid year and well played Toro Rosso too. Simple take away is Mercedes is the engine to have and Renault have a bit of catch up to do. A great day for Hamilton, Rosberg and especially Ricciardo. 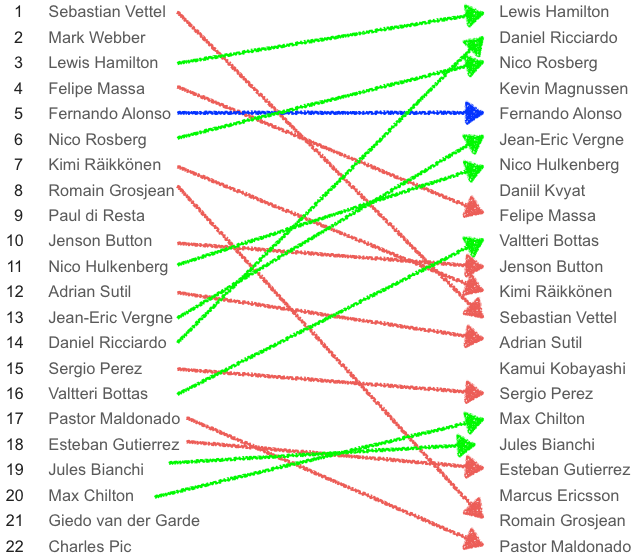 As for Vettel I don’t think you can blame waved yellows or conditions as Ricciardo was consistently quicker than him throughout qualifying. Hulkenburg proved his class and Bottas showed promise in the Williams. The other positives were the young guys coming in and performing great – bodes well for a competitive season. 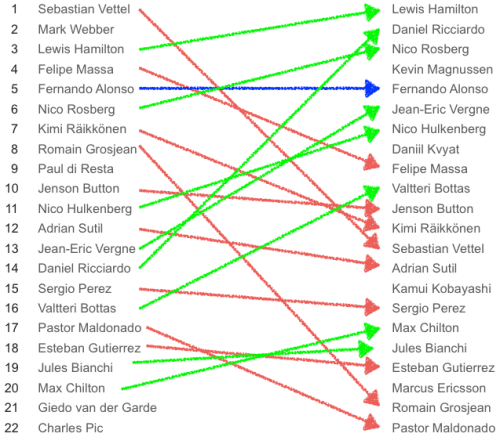 Alonso must have a sense of deja-vu and if Ferrari don’t improve I can see him move next year. Button was disappointing and Grosjean must wonder what the next year holds for him. I’ve got high hopes that this will be a cracking season, partly after last years dominance by Red Bull and Seb Vettel and also due to the unreliability that the cars have and also the potential for more overtakes due to the regulation changes. Roll on 6am tomorrow!